Ms. Makotose brings to the mission a wealth of experience in policing and management. Her policing career spans 30 years with expertise in police command. 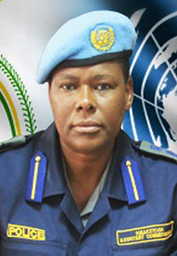 She served in many capacities in Zimbabwe including crime management and investigation, Police Administration, Deputy Director for Administration in Criminal Investigation Department of Zimbabwe Republic Police and she was among the officers who served in UNMIL in 2005. Ms. Makotose earned her Master’s Degree in Business Administration from National University of Science and Technology in Zimbabwe. She is married and has two daughters and two sons.